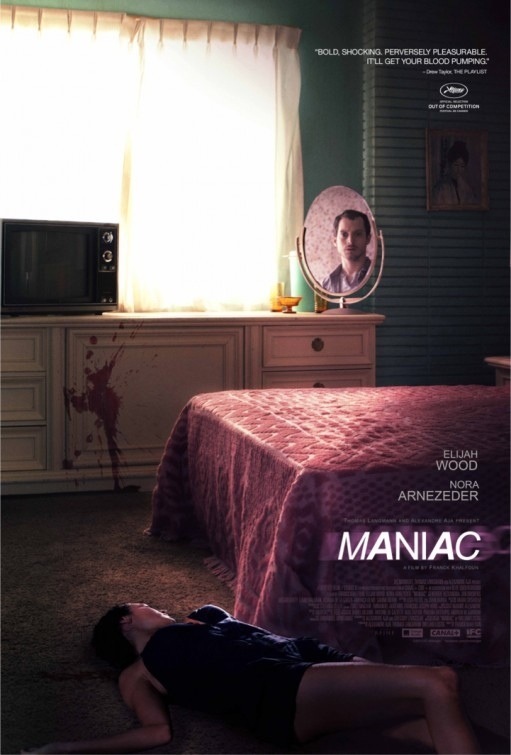 Released in parts of Europe in 2012 and than in 2013 in the States, Maniac is a remake of a 1980 film of the same name directed by William Lustig who also serves as an executive producer on the remake. Times sure have changed since back in 1980 when the original Maniac was released it caused quite a bit of controversy, which you see in more detail in the Blue-Underground 30th Anniversary edition. Like other films such as I Spit on Your Grave and Silent Night, Deadly Night, which also caused a lot of controversy and both remade without people batting an eye this version of Maniac has no controversy either. The original film is one of my favorites and while most people cite the death scenes, which were done by Tom Savini I actually think the film has far more to offer than given credit for. When I first heard of a remake I was really unsure what to think. While a lot of classic and cult classics have been remade the ones that worry me the most are films like this, Last House on the Left and I Spit on Your Grave. The reason they concern me is these low budget gritty exploitation films when remade often look too polished and even if they aren’t bad films they lack that raw exploitation edge of the originals so I wasn’t really looking forward to this. Director Franck Khalfoun also had me a bit worried since I wasn’t really fond of P2. While not a terrible film I wasn’t really into it though I did like the death scenes so that gave me a little bit of hope for this and with the script by Alexandre Aja & Gregory Levasseur that did however peak my interest a bit, but also caused a bit of worry as since High Tension they’ve become a bit Hollywood and even if I more or less still enjoy their work they are remaking one of my favorites. When I first heard Elijah Wood was cast to play the role of Frank I really didn’t know what to expect and while a good actor I just couldn’t see him in a role like this and when footage was first released I was less than impressed as it sort of looked like an art house film. However all of my concerns were wiped away as I was watching the remake. Maniac is in my opinion one of the better remakes that while in my opinion not as good as the original can stand proud next to it. Out of all the exploitation film remakes I’ve seen this was by far the best. As I stated the others were a little polished looking and while this doesn’t have that gritty look of the original it also doesn’t look nice and clean either. Maniac is the ideal remake in regards that it isn’t a remake by name only, but yet it doesn’t rehash the original either. The 2012 version of Maniac has the same basic idea and even a few scenes in common, but it has a style all of its own and even in the scenes that are a like the makers put their own twist on it rather than simply being lazy and rehashing the original. The biggest difference between the two films is the setting; the original was set in New York and the remake Los Angeles. What really makes this film stand out is the use of the POV shots. Those are nothing new in film and hardly anything new to the horror genre as many upon many horror films such as Black Christmas and Friday the 13th have used POV shots. However the way it’s done here feels fresh and almost feels like something that’s never been done before, which I’ll explain a bit more later on. The screenplay by Alexandre Aja & Gregory Levasseur has more or less the same plot as the original and the same set ups however Aja & Levasseur give it their own spin and never rehash the original. In the original psychical and mental abuse from Frank’s mother is implied but never goes into much detail in this version a little more is done with that however its not explained in every single detail. Character development is more or less the same as the original, but the film is about the villain and it works just as well here. The script by Aja & Levasseur is quite strong and its clear these guys understand the nature of the film they’re working on. As director Franck Khalfoun crafts an eerie and graphic film. From the very start of the film, Khalfoun sets up an eerie tone due to the first death scene, which was highly effective and Khalfoun maintains that tone throughout. The death scenes while not overly gory for the most part are however very graphic and perhaps a little mean spirited. Like how the script never rehashes the original Khalfoun never rehashes what Lustig did with the original and always puts his own twist on scenes that are like the original. I find the original film underrated and while the gore F/X were terrific it also has scenes that are highly suspenseful such as the subway scene and while this version in my opinion wasn’t as suspenseful its still very effective and eerie. Speaking of the subway scene this version has a great homage. While Frank is stalking a victim in the subway it than leads to a parking lot where Frank murders a girl and decapitates her. Then we have a shot of Frank holding the head in one hand and a knife in the other and the shot is framed just like the poster for the original. Like I stated I wasn’t really fond of P2, but with Maniac it makes me excited for what the future holds for Franck Khalfoun. 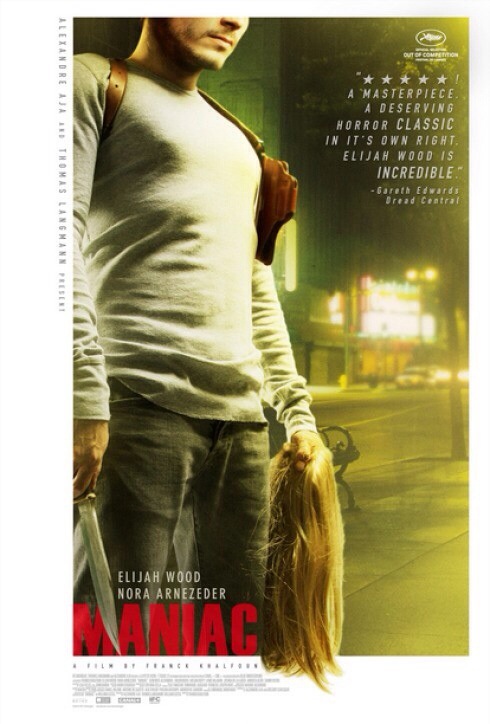 The film is mostly shot in POV shots and Elijah Wood actually has a small amount of screen time. The way Khalfoun uses the POV shots makes this film feel fresh and different. Like I said POV shots aren’t anything new in the horror genre, but the way it’s used here it sure does feel like something we haven’t seen before. This in part is what helps make Maniac not just stand out from the original, but also makes it quite chilling. We’re seeing through the eyes of a very deranged person and also the way it’s done you also sort of feel like you’re actually there. 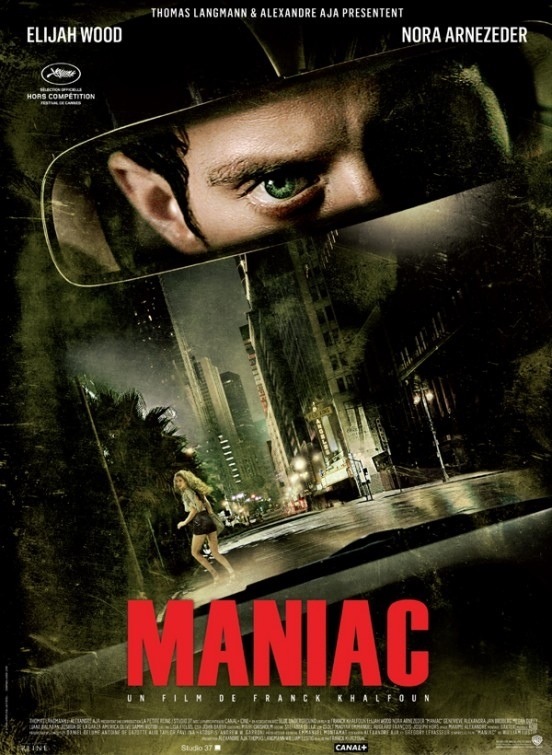 Unlike most exploitation remakes like I said Maniac doesn’t look too polished and it does have a gritty look to it though it does lack that raw edge of the original and I think as much as I liked this film had it been shot on 16MM film I would have liked it even more. Franck Khalfoun delivers a very chilling film that while a remake also feels quite different than what we’ve seen. While not as gritty as the original it’s still almost as solid. Like I said going into Maniac I expected the worst, but it turned out to be a terrific film that makes a great companion piece to the original. Filmmakers should really take note as this is how you do a remake. It keeps true to the original, it has the same plot more or less and a lot of scenes that are like the original however Franck Khalfoun as well as Alex Aja and Gregory Levasseur put their own twist on things and it never feels like a rehash. 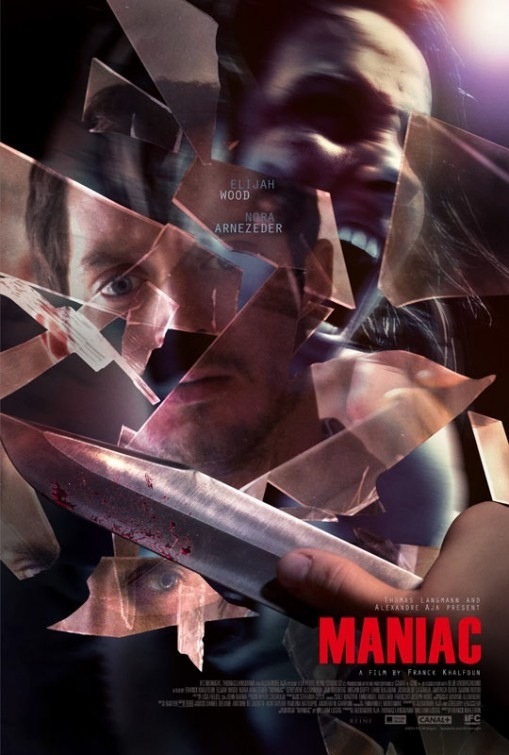 Maniac in my opinion is one of the best horror films of 2012 if not the best. And if you wanna go based on the American release it’s the best of 2013. Maniac is a chilling and highly suspenseful film.